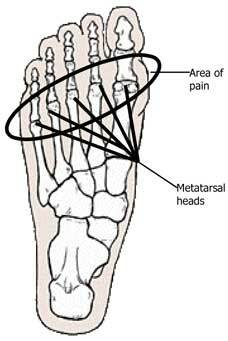 Metatarsalgia (also known as Metatarsophalageal joint synovitis) is a general term used to denote a painful foot condition in the metatarsal region (the area just proximal the toes, more commonly referred as the ball-of-the-foot). It is a common inflammatory condition occuring most frequently in the second, third and/or fourth metatarsophalangeal joints, or isolated in the first metatarsophalangeal joints. This is a disorder that can affect the bones as well as joints at the plantar forefoot. Metatarsalgies are often accompanied by excessive callus formation over a bony protrusion, with severe pain and pressure sensitivity around the callus. 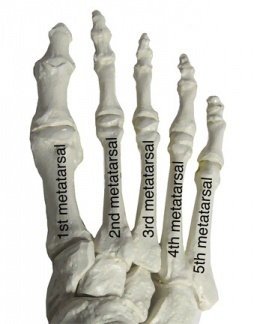 The most important and relevant anatomy is the metatarsals.The metatarsus of the foot consists of five long bones, which are called the metatarsals. Similar to the the metacarpals of the hand, the metatarsals are comprised of a proximal base, shaft and distal head. Along with the tarsals, the metatarsals help form the arches of the foot, which are essential in both weight bearing and walking. The metatarsals are proximally connected to the tarsal bones and distally to the the phalanges. The metatarsals connect the ankle with the toes. They are named I to V medially to laterally, from the dorsal surface of the foot. The metatarsal bones are convex on their dorsal surfaces but concave on their plantar surfaces. The proximal base of the metatarsals articulates with one or more of the distal tarsal bones; the cuboid and the cuneiform bones. These articulations are known as the tarsometatarsal joints. The joints between the metatarsals and the repsective proximal phalanx is called the metatarsophalangeal joint (MTP). These joints form the ball of the foot, and the ability to move in these joints is very important for normal walking.In addition, the bases of the metatarsals articulate with each other to form intermetatarsal joints. Knowledge of the other foot bones and structures (muscles, tendons, ligaments…) is also necessary to distinguish the sctructures and pathologies. More information about anatomy of the foot and ankle can be found here. 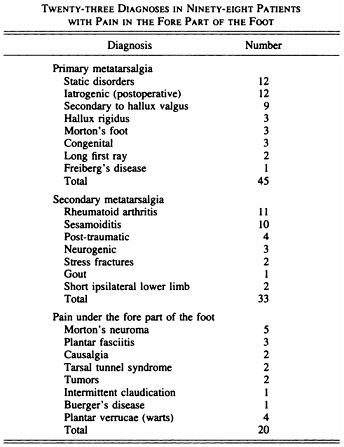 There can be multiple causative factors that lead to the development of metatarsalgia, but the majority seem to be related to foot and ankle deformity. This can lead to a fundamental etiological component of metatarsalgia, that being the repetitive loading of a locally concentrated force in the forefoot during gait. Morton’s foot—there is a shortened first metatarsal, which results in an abnormal subtalar joint, and increased weight going through the second metatarsophalangeal joint. Forefoot pain may also be caused by conditions of the lesser toes, such as hammertoes, mallet toes, and claw toes. The pathophysiology of lesser toe deformities is complex and is affected by the function of intrinsic and extrinsic muscle units. In addition to lesser toe and metatarsal abnormality, forefoot pain can be attributed to interdigital neuritis, disorders of the plantar skin, and gastrocsoleus contracture. Norman Espinosa divided metatarsalgia into three categories in his review. He listed the various conditions associated with each subtype. Secondairy metatarsalgia can be caused by systemic conditions such as arthritis of the MTP joint. Iatrogenic metatarsalgia can occur after (failed) reconstructive surgery. Metatarsalgia typically affects the bottom of the second metatarsophalangeal joint. However, any of the other metatarsals can be affected. In more unusual cases, more than one metatarsal can be affected on one foot. When metatarsalgia affects the second metatarsophalangeal joint, it also sometimes referred to as “second metatarsophalangeal stress syndrome”. Increased pain during the mid-stance and propulsion phases of walking as body weight is shifted forward onto the forefoot. The pain is typically described as a deep bruise. Sometimes, it will feel like there is a rock under the ball of the foot. These symptoms are usually worsened when walking or standing barefoot on a hard surface or poorly cushioned shoe, and better when in well-cushioned shoes. At the end of a day, with substantial standing and/or walking, the area can throb. It is not uncommon to have a callus located under the affected metatarsal. Pain usually is first noticed at the bottom of the ball of the foot and there is no swelling. With progression, swelling can appear, along with tenderness at the top side of the joint. In some cases, bursitis will form adjacent to the metatarsal. In even more advanced cases, the joint capsule and ligaments on the bottom of the joint can wear-out and rupture, leading to the progressive development of a hammertoe. Prof. Espinosa found that claw-toes with synovitis or even subluxation of the MTP joints were a common finding. To differentiate one diagnosis from another, the use of the patient’s history, physical exam, roentgenograms, cholesterol-crystal force-plate analysis, intra-articular/digital injections and additional laboratory studies (electromyography, arteriograms, venograms,..) can be used. any stiffness or deformity (including length discrepancy) which might alter pressures on the forefoot? hammer or claw toes - if so, how flexible is the MTPJ. With the MTPJ reduced (if possible) is the fat pad reduced under the metatarsal heads? Physical Examination Findings: MTP joint pain, thickening or swelling of the MTP joint, diminished toe purchase, negative drawer test result. Physical Examination Findings: MTP joint pain, swelling of MTP joint, reduced toe purchase, mildly positive drawer test result (<50% subluxated). Physical Examination Findings: MTP joint pain, reduced swelling, no toe purchase, moderately positive drawer test (>50% subluxated). Physical Examination Findings: Joint and toe pain, little swelling, no toe purchase (can dislocate MTP joint), flexible hammertoe. The treatment is initially non conservative. The pressure on the forefoot can be reduced by stretching exercises to perform at the level of the lower limb, amounting. Also custom-made orthopedic insoles can reduce pressure. Sometimes, in very specific cases, an infiltration, followed by taping a few weeks, brings some comfort, also some mobilization exercises are recommended. Gajdosic and coworkers demonstrated that a 6-week stretching program increased the maximal ankle dorsiflexion angle and length extensibility. They further demonstrated that stretching enhances the dynamic passive length and passive resistive properties. - level of evidence 1b. Distal metatarsal osteotomies (such as The Weil osteotomy) provide a longitudinal decompression and is particularly relevant in patients suffering from metatarsalgia due to an excessively long metatarsal. One problem is the plantar translation of the metatarsal head during shortening. - level of evidence 3a . Based on those results, Maceira and coworkers introduced the so-called “triple-osteotomy”. This modified osteotomy affords precise and accurate shortening of the metatarsal without unwanted plantar translation of the heads. The triple osteotomy also preserves the relationship between the dorsal interossei and transverse axis of rotation of the MTP joint to avoid an extension deformity. - level 4 evidence. Espinosa stated (with 2 clinical studies (level 2A evidence) and 1 retrospective study (level 2B evidence) as reference) that generally, accommodative insoles may redistribute pressure under the foot while functional orthoses are intended to control abnormal intersegmental motion. But both of them may be useful in the non-operative management of metatarsalgia. J. Gregg, P. Marks (2007). Australasian Radiology: Metatarsalgia: An ultrasound perspective. The Royal Australian and New Zealand College of Radiologists. Pages 493-499. Walter R. Frontera, Julie K. Silver, Thomas D. Rizzo (2008). Essentials of Physical Medicine and Rehabilitation. Elsevier Health Sciences. Pages 461-475. 2013 Dec 10. Metatarsalgia, lesser toe deformities, and associated disorders of the forefoot. 10. Maceira, E. et al, Analisis dela rigidez metatarso-falangica en las osteotomias de Weil. Revista de Medicina y Cirugia del Pie. ↑ 2.0 2.1 2.2 Brukner P. Brukner & Khan's clinical sports medicine. North Ryde: McGraw-Hill; 2012. ↑ J Bone Joint Surg Am. 1980 Jul;62(5):723-32. Scranton PE Jr; Metatarsalgia: diagnosis and treatment. ↑ Martinez, Bruna Reclusa, et al. Validity and reliability of the Foot Function Index (FFI) questionnaire Brazilian-Portuguese version. 2016. ↑ Haque, Syed, et al. Outcome of Minimally Invasive Distal Metatarsal Metaphyseal Osteotomy (DMMO) for Lesser Toe Metatarsalgia. Foot & Ankle International. 2015. ↑ Gajdosik, RL, et al., A stretching program increases the dynamic passive length and passive resistive properties of the calf muscle-tendon unit of unconditioned younger women. Eur J Appl Physiol. ↑ Maceira, E. et al, Analisis dela rigidez metatarso-falangica en las osteotomias de Weil. Revista de Medicina y Cirugia del Pie.